Interactive Forecast 2015 – Tune Up Your Year! The new year of 2015 will be characterised by great calm and sanity, as the anxious earthly ram replaces the spirited fiery horse. From the end of 2014 onwards a new ideological trend will form in public conscience, and will remain dominant from autumn 2015 until 2018. Society will re-examine its system of values and rules under the influence of this new ideology, and scientific discoveries will change the familiar picture of the world. A regrouping and polarising of forces will take place in 2015 – new political blocs will be formed on the basis of ideological convictions, other forms of cooperation will appear and state borders will be re-examined, all of which will slow the processes of integration and globalisation. Industrial capital will gather in strength, and there will be a boom in construction, especially long-distance communications – roads, metro networks, bridges and pipelines – which in the future may lead to the appearance of new transport systems. Efforts will be applied to conquering the Arctic and Antarctic shelves and to the development of new concepts in space exploration. We can expect expeditions to the poles and to mountain peaks, as well as curious discoveries by geologists and archaeologists. New laws will be adopted in the sphere of international law, political structures, immigration, science, and education, and preconditions will be established for the reform of the global monetary system. The adaptation problems experienced by migrants will require the passing of laws regulating labour relations and the rights of the working masses. A new phase in the development of computer technology and computer programs, alongside the appearance of new threats to information security, will force countries to take serious measures regarding control over the internet. New discoveries in physics and genetics, as well as problems caused to the environment by the action of technological progress, will raise moral and ethical questions that concern the whole of humanity and require careful regulation on the part of lawmakers. The year 2015, especially June and July, will be marked by a confrontation between the twin poles of good and evil, in which first one, then the other, will get the upper hand. Intuition will oppose the voice of reason, attention to external beauty and physical health: spiritual purity, and kindness and compassion will openly contradict rationalism and consumer attitudes. This year will lay bare ‘dark sides' and vices, teach people to recognise the bad and the good more clearly and take a stand against evil, which will also be gathering its supporters. The problem of choice will escalate at the end of August and during the autumn of 2015. The forces of light and dark are polarising! Extraordinary situations in 2015 may occur due to earthquakes, hurricanes, landslides, pipeline disasters, and the deterioration of ecology, including the pollution of the land as a result of the disposal of harmful substances or gases. 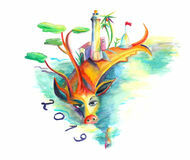 The year 2015 will be especially important for Sagittarians and Gemini born in late November or late May, who will learn important life lessons that will temper the body and spirit; many will face significant events connected with education, moving, or a change in social status. Install the mobile app to find out whether this situation affects you personally! The first days of January are complicated by conflicts and protests brought about by the necessity of resolving painful issues and, at the same time, a refusal to concede ground; there is an increase in the number of accidents. Circumstances may take an unexpected and extreme turn for Capricorn and Aries. Install the mobile app to find out whether this situation affects you personally! Throughout the period from January through to August 2015, society will be disturbed by fears linked to illnesses, ageing, medical services and working conditions. There will be an increase in the number of workers who fail to display a conscientious approach to their duties, including incompetent doctors. Petty intrigues, sycophancy and bureaucratic red tape will flourish. This will lead to a growth in demand for medical devices and portable gadgets that monitor health, recording devices and cameras, which will eventually result in total spy mania! The abovementioned trends may manifest themselves particularly strongly from July 2-11, 2015. Among those who are advised to curb their mistrust and display clear-headedness regarding health and treatment are Virgos and Pisces – they are better off steering clear of bad habits. At this time it is especially important to monitor the purity of your thoughts, after all, the root of all illness is in the spiritual sphere and in our thoughts! Install the mobile app to find out whether this situation affects you personally! Virgos may experience a biased, negative attitude from those around them or risk getting bogged down in trifles, criticism and grievances themselves. The advice to Virgos is to accuse nobody and continue to carry out their obligations in good conscience as normal – just be patient, things will soon work out, but for now your credo should be to remain above petty faultfinding! Pisces should fortify their spirit, otherwise they may be hurt by the injustice and callousness of those around them. From the beginning of January and all the way through to the beginning of February, peaking on January 18-22, 2015, the financial situation will be misleading and ambiguous. Penny-pinching, greed and economy drives may be interlaced with brazen fabrications, fraud and large-scale speculation. There is an increased risk of viruses, poisoning and various kinds of addictions. Pisces and Virgos can easily fall into illusions or debts. Install the mobile app to find out whether this situation affects you personally! From the last week of February, new political forces, achieving freedom and independence, will take a confident step forward, but nearer the middle of March 2015, close to the eclipse of the 20th, these forces will encounter obstacles, provoking stormy outbursts of protest and an escalation of old conflicts (including those which began in 2014), which may even spread to other countries. Social problems and a strengthening of radical political views may slow reforms until the summer. The last week of February and the first half of March will be favourable. Leos, seized by enthusiasm, will become leaders, and only excessive presumptuousness may lead them to fail. Aries will have the opportunity to use the changes to their own advantage - the most important thing for them is not to invite trouble in the period around the eclipse. It's better to sit out the eclipse of March 20 quietly and silently, drawing your own conclusions, leaving everything else in the past and making no new plans. Install the mobile app to find out whether this situation affects you personally! In the middle of March, everything that began so well and developed in February runs into difficulties (install the mobile app to find out whether this situation affects you personally!). It will be unclear whether the appearance of technical innovations, fashionable trends, new ‘stars' and political leaders at this time is for good or bad, and the inclination will be to quickly distance yourself from those who did not justify your hopes. Fire signs and all those who have already tasted the fruits of joy and success will have to wait a little before they see their ideas brought to life! April, continuing the rebellious trends of March, will keep people on their toes and brings changes. The period from April 16 to May 4 throws the doors wide to everything new and advanced, paving the way for new ideas, reform and different kinds of innovations, but will provoke unforeseen, extreme events, pushing you towards bold and aggressive deeds. Technical breakdowns and accidents are possible, including those caused by extreme weather conditions such as winds, storms, and hurricanes. Aries and Libras will feel the changes stronger than anyone, and while Aries are capable of making a stunning impression, then Libras may find that, on the contrary, something not entirely pleasant befalls them. Install the mobile app to find out whether this situation affects you personally! May looks quieter, with only the first days and the middle of the month being restless. Problems with communication may arise around May 21-24, so it's better to postpone any meetings or signing of documents. Install the mobile app to find out whether this situation affects you personally! From June 11 onwards, everything that was impeded in March will be achieved: reforms will be actively carried out, international relations will improve, liberation and social movements will find support, inspired by their leaders, while their opponents build up their strength in order to take revenge. Society will receive a strong impulse for freedom and creation, seized by euphoria from the changes and new interests! New inventions and technical gadgets will appear, new styles will become trendy in fashion and design, and the brightest stars of show business will illuminate the stage. International exhibitions, presentations, and charity festivals will be organised thanks to sponsors and patrons. Many will receive the opportunity to broaden their horizons through travel, moving, education and spiritual development. Install the mobile app to find out whether this situation affects you personally! Success and recognition awaits Leos; Aries will experience changes and discover new interests, while Sagittarians and Gemini will be picked up by the tailwind! Only Sagittarians and Scorpios born around November 21-22 will feel limited. Scorpios can adapt to any situation – what doesn't kill them makes them stronger – but Sagittarians are too serious, so risk missing lucky opportunities. Install the mobile app to find out whether this situation affects you personally! The most benevolent time of the year, a period which favours creativity, love and relaxation, comes at the end of June. Another favourable moment will come in the middle of August and after the 20th – feelings and interests will flare up with new energy; some will see their former loves return to them, and those who have not had time to relax will want to make up for lost time! Install the mobile app to find out whether this situation affects you personally! The second half of 2015 will bring a global clash of interests and open confrontation, both in the international arena and on a regional level, which will lead to coups, changes of regime, and the establishment and overthrow of dictators. It will be difficult for political leaders to come to agreement with each other, since the interests of power, industrialists and financiers are in direct opposition. The most desperate confrontation will come about as a result of attempts by new political forces to carry out a repartition of the world according to their principles. From July 23 to August 10, peaking on August 2-3, attempts to frustrate the new political formations and movements cause a rise in social tension, bursts of protest and upheavals in power (which in some places may even result in a revolutionary situation!). Economic problems, bankruptcy and staff cuts will force many to search for other sources of a livelihood. It is important to make use of the favourable opportunities of the first half of the summer in time, since the end of July 2015 will derail the hopes and plans of ‘latecomers'! This situation concerns Leos, Scorpios, Taureans and Aquarians most of all. Leos are in the best situation, since they have the chance to defend their position. Install the mobile app to find out whether this situation affects you personally! From August 11 the ambitious projects of the first half of 2015 will be replaced by real plans, which will last until the autumn of 2016. People are more concerned with essential matters – work, health, daily life, the selection of goods in the shops and central heating in their houses. There is a growing tendency to unite along professional lines; workers will be able to achieve an improvement in their working conditions and the recognition of their rights. Success will be achieved by those who work diligently for a common cause and don't try to hog the blanket for themselves! This period is most favourable for Virgos, Capricorns and Taureans. People will become pickier about their diet and more attentive to their health, which will increase demand for health foods, eco-products, medical services and sport. A growth in the number of private farming enterprises and the fragmentation of large companies is a possibility. The number of low- and mid-level officials in large companies and government structures will grow. Proven scientific theories will gain acceptance. And the supposed authority of some academic, politician or celebrity may be rapidly deflated as a result of what seem to be sheer trifles. From August 25 until September 3, many will reap the rewards of their actions and receive what they deserve for their deeds, perhaps even high-profile court cases. Install the mobile app to find out whether this situation affects you personally! September brings everything back down to earth – after all the pretentious proclamations, a real calculating of losses and attempts to reduce debt with credit are taking place, both on a national level and on a company level. Any kind of provocation could be used as a means to find capital, including a financial crisis. Unfulfilled promises, a rise in prices (including for utilities and fuel), and dissatisfaction with working conditions and the health system may lead to officials being relieved of their posts – and not necessarily those who are genuinely guilty, but those who can be conveniently framed. The eclipse of September 13 aggravates the situation. Corruption scandals, fuel disputes, and social anxiety over the threat of epidemics are all a possibility. The general public is now particularly suspicious and can easily lose trust in social networks or similar projects, for example, due to computer viruses or fraud. This situation will principally affect Virgos and Pisces, who should beware of financial blunders. Install the mobile app to find out whether this situation affects you personally! Starting from September 17 and peaking at the beginning of October 2015, it will be difficult for partners to reach agreement, and things could even go as far as legal proceedings! Delays occur as a result of confusion and procrastination with documents, and cases of their forgery become more and more widespread. Libras will be dwelling in doubt and ‘fog', while Aries will lose faith in their partners – they are advised not to conclude important deals and to put any weddings on hold! The lunar eclipse of September 28, thickening the fog before the eyes, causes emotional tumult and pushes people into making a mistake, infidelity, betrayal, or breaking one's word or the law. For a week before and during the week after the eclipse it will be easy to cause misunderstandings in personal relationships or fall victim to injustice. Install the mobile app to find out whether this situation affects you personally! October is a time for big business and industrial capital. Large-scale projects will be realised, major deals will be concluded and important mergers will take place. Companies that are opened from October 11 onwards will hit upon the tried and tested formula to success (the best dates are October 13, 14, 19, 22, and 28). This is a suitable time to promote and expand your business and resolve questions concerning property and finances. However, projects begun now cannot afford mistakes, since an accidental lack of foresight or dishonesty could ruin the whole thing and lead to court proceedings, especially for Libras and Aries! Install the mobile app to find out whether this situation affects you personally! The principle for October is precise organisation and management. This is an especially fruitful time for Virgos, Capricorns, Taureans and Scorpios, who are capable of moving mountains and making a fortune! Install the mobile app to find out whether this situation affects you personally! The period from October 14 to November 11 will raise the issue of justice and will bring legal proceedings in its wake. Many will be faced with making an important choice. It will be easy for Libras to make mistakes, confusing good and bad, and Aries will want to call their partners' bluff. Install the mobile app to find out whether this situation affects you personally! The time from October 24 to November 23 will spur a rebellious mood, causing outbreaks of protest and extremism; technical breakdowns and natural disasters may occur. Libras and Aries will be held hostage by unforeseen circumstances. Libras in particular would be better off quietly sitting out this autumn, trying not to make a mess of things, especially around November 30! Install the mobile app to find out whether this situation affects you personally! From November 13 until December 14, 2015, peaking at the turn of the month, a struggle for spheres of influence will be being waged against a background of tightening of sanctions, difficult or unpopular reforms and a growing economic crisis, which will spark off crimes by those with radical views, an ideological schism and a mood of panic in society. An escalation of inter-ethnic and religious conflicts is possible. There is an increased risk of earthquakes, landslides and pipeline disasters taking place. Sagittarians, Pisces, Gemini and Virgos risk suffering from the wiles of enemies and incurring financial losses. From December 4 to 14, unexpected events may throw Aries, Libras, Capricorns and Cancerians out of their stride. Install the mobile app to find out whether this situation affects you personally! At the beginning of 2015 it's worth setting targets for the next few years and even writing out a plan! This year will give power to those who draw upon clear views and principles. This is a more a time to be wise and flexible with your strategy, advancing towards your goal through small victories, than to be an intransigent soldier who tries to achieve everything at once.